There’s no faulting the warm Scandinavian ethos of the Finnish label Samuji. Counting both men’s and women’s fashion, plus a line of objects for the home under its belt, Samuji has recently created an equally beautiful environment to house all of its collections under one roof. Known as Samuji House, the label’s latest boutique is situated in a courtyard building in the heart of Helsinki. Spread across two floors, the store’s collections are stylishly laid out for easy perusal. From quietly structured clothing made from fine Italian and Japanese fabrics, to elegant everyday accessories featuring classic silhouettes and assortment of Japanese towels, Finnish blown glass vases and translucent bars of soap that make up the brand’s Koti home collection, visitors to the shop will feel like they’ve stumbled in on someone’s (very) well-appointed home. 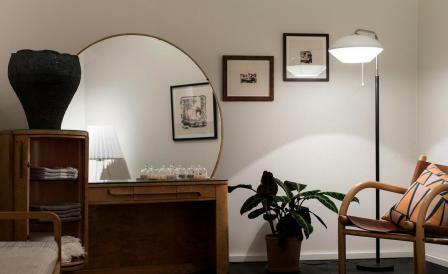 In addition to Samuji’s own wares, the store is also peppered with furniture from Artek and essentials by the Danish clothing brand, Base Range.